Do Fake Security Signs Really Help to Protect Your Home? According to the FBI crime report, as many as 1 in 36 homes in the United States are burglarized each year. The city you live in, as well as your neighborhood, play an important role in determining your risk for burglary or break-in, but the truth is that any home could become a target. Savvy homeowners have begun to take matters into their hands by taking steps to make their homes less appealing to potential burglars. One of these steps involves using fake security signs and stickers to make a thief think twice about targeting their home. But do fake security signs work to deter burglars? Or is it worth the cost to protect your home with a home security system or other anti-burglary equipment? Keep reading to learn the pros and cons of using fake security signs and to find alternative ways to protect and secure your property. How Do Fake Security Signs Keep Your Home Safe? Simply making potential burglars think that your home is protected by a security system might be enough to deter them. They may not think it is worth the risk. Purchasing fake security signs and stickers could cost as little as $10 – that’s a fraction of the cost for a home security system, especially one with 24-hour monitoring. You might even be able to get an extra sign for free from a friend or neighbor. It only takes a few minutes of your time to hammer a sign into your yard and to put stickers in your windows – installing a real security system could take hours, and you may have to hire a professional to do the work. Depending on where you get them (or if you make them yourself), fake security signs and stickers may look obviously fake. Any experienced burglar will know what a real security system sign looks like or they can just Google the name on the sign to verify its authenticity. Using the name and logo of a real security system company without paying for their services could get you into legal trouble for the use of copyrighted material. You could end up paying a fine or even some expensive legal fees. If the burglars enter your home anyway, nothing will happen – you don’t have a real security system to alert you to the break-in, and the authorities won’t be called on your behalf – this applies to fires as well as burglaries. No security system is perfect, either real or fake. There is always the possibility that the burglar will break into your home anyway. If you have a fake security system, you may not even know that the break-in is happening and you won’t have the benefit of 24-hour monitoring so that the authorities won’t be called to the property. 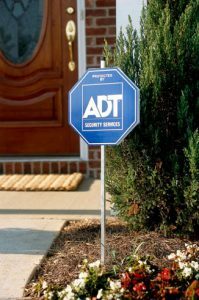 Think carefully about the risks and benefits of using fake security system yard signs and stickers before you choose this option. Motion-activated lights. Many burglaries happen under cover of darkness. That means that one of the simplest things you can do to deter burglars is to take away the darkness. But rather than spending a small fortune on electricity to illuminate your entire property, installing motion-activated lights may be enough to discourage trespassers and burglars. Landscape your yard strategically. It is common for burglars to evaluate a home before burglarizing it to determine how easy it will be to get in and get out. If you have tall trees or shrubs bordering your property for privacy, you could be offering potential burglars natural cover to use when casing your home. To deter burglars, avoid planting bushes and shrubs directly below windows and make sure that you have clear sight lines to all doors and windows. You should also install some spotlights and path lighting to keep your property well-lit at night. Lights on an automatic timer. Though burglars don’t always strike at night, they do prefer to strike when they think no one is home. So, the trick to deterring burglars is to make them believe that you are at home and one way to do this is to hook your lights up to an automatic timer. By setting different timers at various times, you can ensure that some lights in your home will always be on (even when you are away) to make burglars think that the house isn’t empty. DIY window and door alarms. You don’t have to purchase an entire home security system to take advantage of door and window alarms – you can buy some battery-operated sensors and install them yourself. These alarms typically come in two pieces – you attach one to the window and another to the frame. When the window is opened, the connection between the two sensors is broken, and it triggers the alarm. These alarms won’t call the police for you, but they can send a burglar running and alert you to the fact that someone tried to enter your home. Get a guard dog. A desire to enhance your home security is not the best reason to get a dog, but it can be a bonus if you choose the right breed. You don’t necessarily need to get a big, aggressive-looking breed, either – even small dogs can make enough noise to send a burglar packing. Choose a breed that suits your family and your lifestyle and you should consider it an added bonus if the dog has natural protective instincts and a tendency to bark at intruders. Install fake security cameras. Installing fake security cameras is on the same level as using fake yard signs and window stickers, but that doesn’t mean it won’t work. If burglars see security cameras installed on your property (especially if they don’t know they’re fake), it could be enough to convince them to move on. You can purchase fake security cameras for as little as $10, and some of them even come with blinking red lights to make them look authentic. Replace your locks. The simplest thing you can do to deter burglars is to keep your doors locked. It sounds like common sense but many people skip this simple step, and they pay the price for it. Not only should you keep your doors locked, but you should consider investing in smart locks that can be connected to a mobile phone app. These locks can alert you each time the door is opened, and you can lock or unlock them using your phone. Install a home security system. If you want to protect your home, your best bet is to install a home security system. While some home security systems are quite complex (and expensive), that isn’t always the case. You can customize your security system according to the features of your property, and to the budget, you have in mind. Home security systems incorporate many different types of anti-theft measures including door and window alarms, motion detectors, security cameras, and more. Plus, many systems come with 24-hour monitoring, so the authorities will automatically be contacted if someone breaks into your home – even if you aren’t there. Any of these options could provide anti-theft benefits for your property and your home – you can even combine multiple options if you see fit. But keep in mind that the most comprehensive coverage will come from a real home security system. In the end, it is up to you which option to choose to protect your home. If you are looking for real peace of mind knowing that your home is secured, it may be worth the cost to install a home security system. If you aren’t particularly worried about a break-in but want to add some security measures to your property just in case, doing something simple like installing motion-activated lights, or security cameras might be the best option. Before you make your choice, do some research to learn the pros and cons of each option that suits both your needs and your budget.